You Say 'Kubbeh,' I Say 'Kibbeh.' Let's Eat 'Em All Right Now : The Salt Regardless of what you call them — kibbeh, kubbe, kobeba — bulgur-and-wheat dumplings are a beloved staple across the Levant. And as with hummus, there are local varieties from Iraq to Egypt. 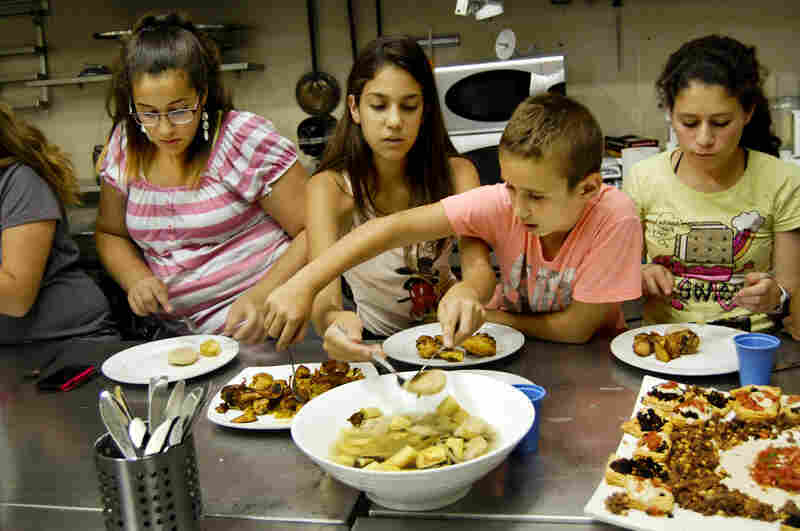 In Jerusalem, kids at a cooking camp learn to make the lemony kubbeh hamusta from Kurdistan. 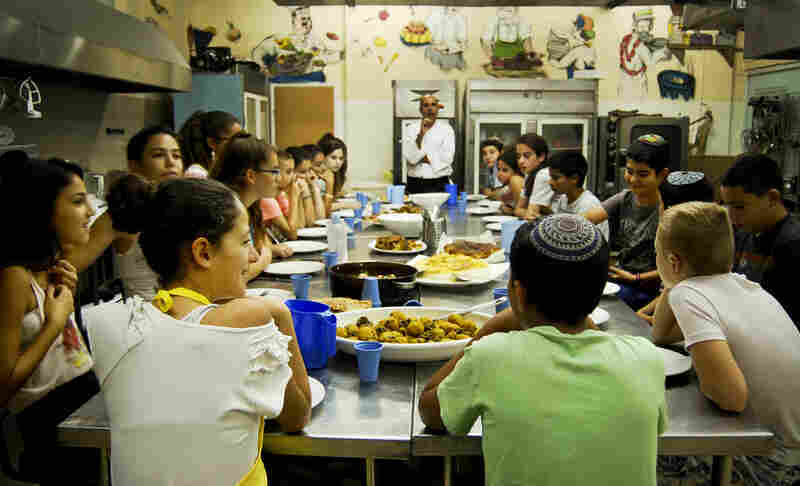 At the Te'amim — or Tastes — cooking camp in Jerusalem, kids dig into a big bowl of kubbeh hamusta, a popular dumpling they learned to make. 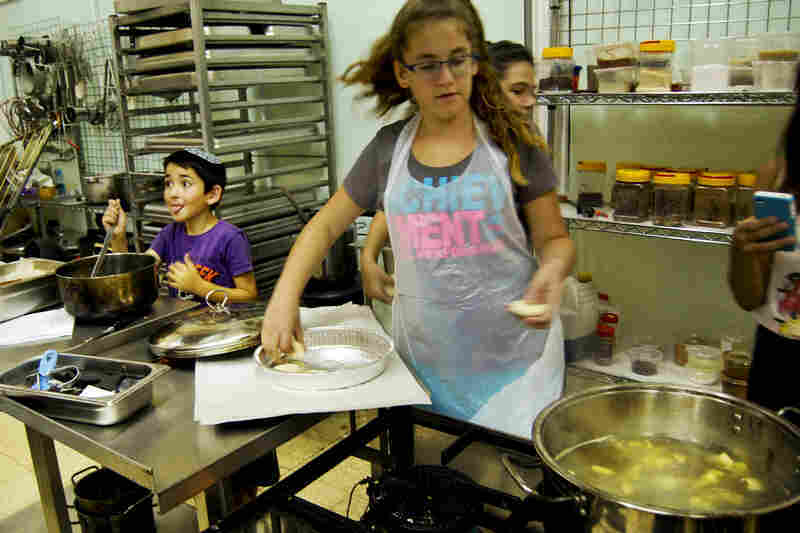 Chef Udi Shlomi advises Aviv Raz, 13, on prepping the kubbeh filling. Kubbeh hamusta, which Shlomi says originated in Kurdistan, has a vinegary-lemony taste. 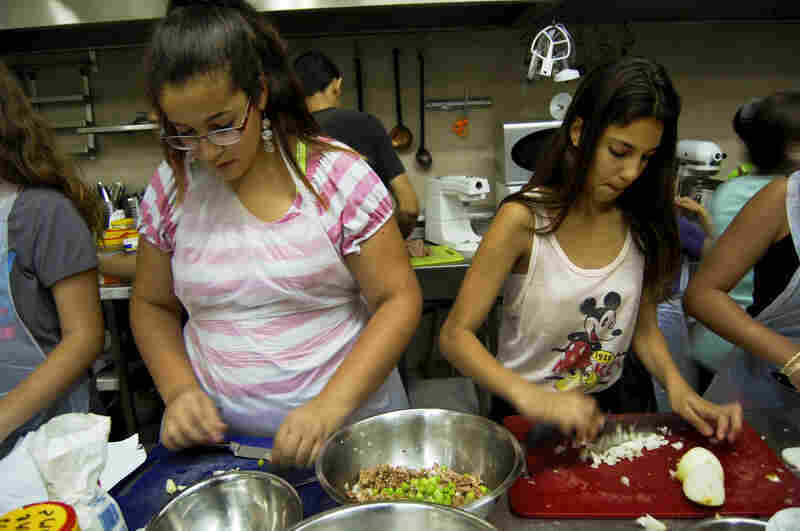 Adi Binyamin (left), 14, and Razs chop onions and celery for the kubbeh filling. Raz gets her fingertips greasy mixing seasoning into the ground beef. The kubbeh dough is made of a little bulgur and a lot of semolina. "Kubbeh dough feels weird!" says Binyamin as she squeezes water into the semolina and bulgur mix. 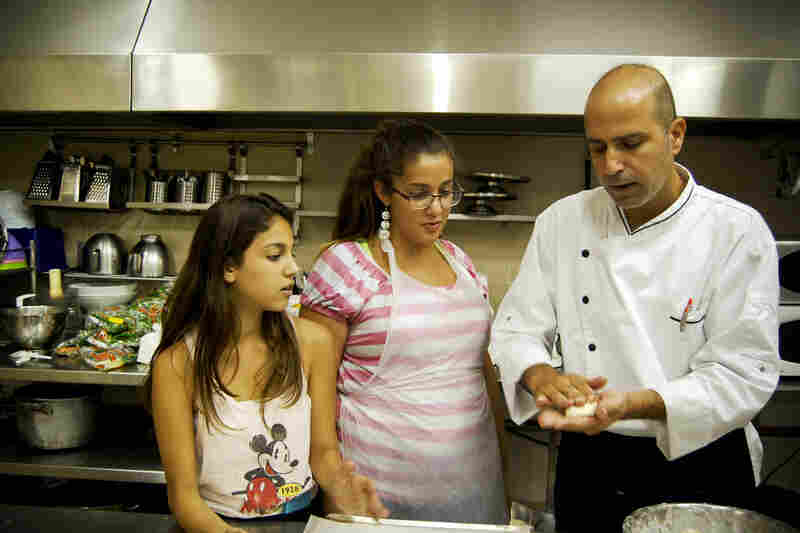 Chef Shlomi shows the campers how to fill a ball of dough with browned meat and pat the kubbeh smooth. 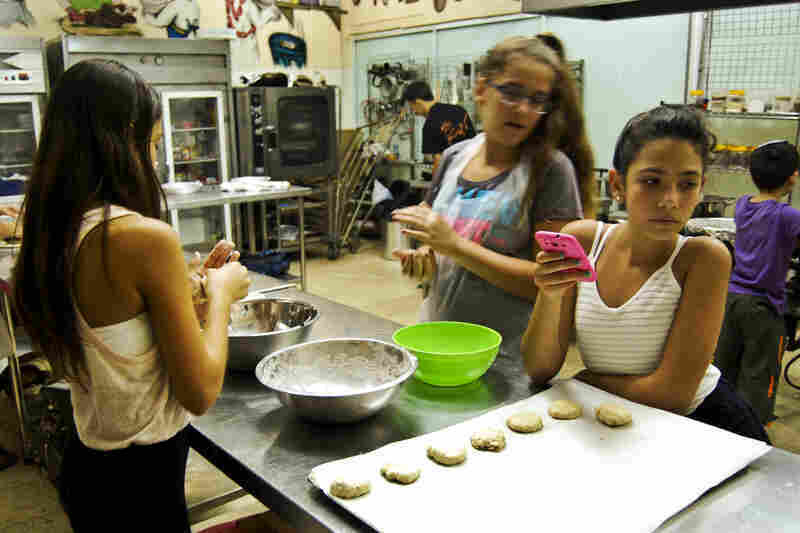 Noa Binyamin, 11, peeks at her friend's pink cell phone while shaping the dumpling mixture in her hands. Binyamin slides the kubbeh carefully into boiling soup. 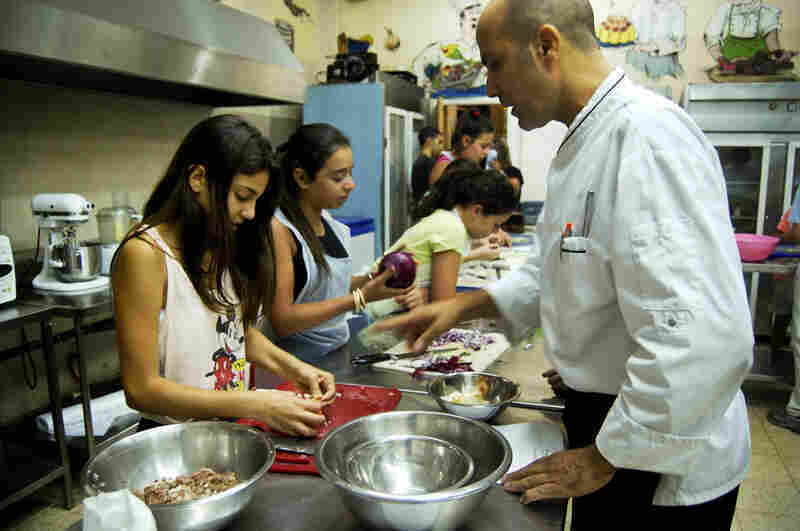 Chef Shlomi ladles out the students' hard-earned lunch. Before the campers can dig into the comfort food they made, Shlomi shares a bit of history about each dish. Like hummus, kubbeh is one of those dishes that is well loved, with local varieties from Iraq to Egypt. People across the Levant love their dumplings, even if they can't agree on a name. Some say kubbeh; others say kibbeh. In Egypt, you might hear kobeba. In Jerusalem, there are perhaps as many variations of the kubbeh as there are cultures in the city. One popular version consists of meat wrapped in bulgur, then deep fried. Dip one in tahini for a crunchy snack. 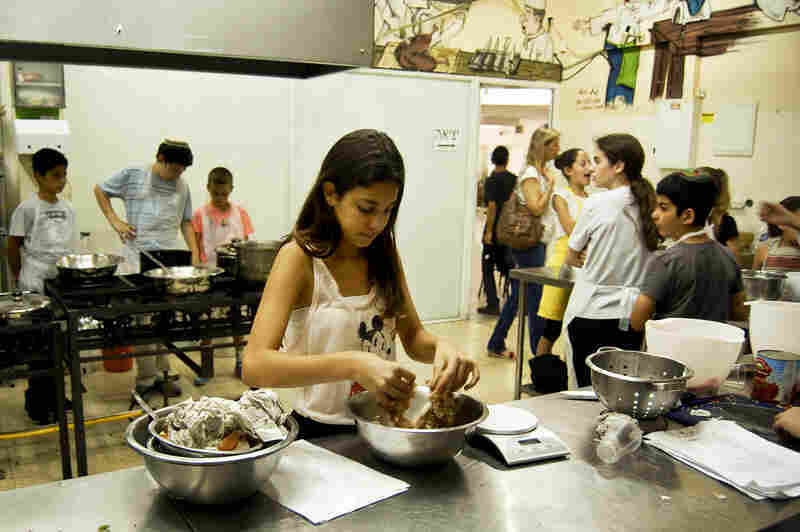 But at the Te'amim — or Tastes — cooking camp in Jerusalem, chef Udi Shlomi prefers to teach kids to make kubbeh hamusta. "Hamusta, it means hamuts, vinegary ... very lemony kind of a taste," Shlomi says. "The hamusta, it's one of the famous kubbeh that came from Kurdistan." 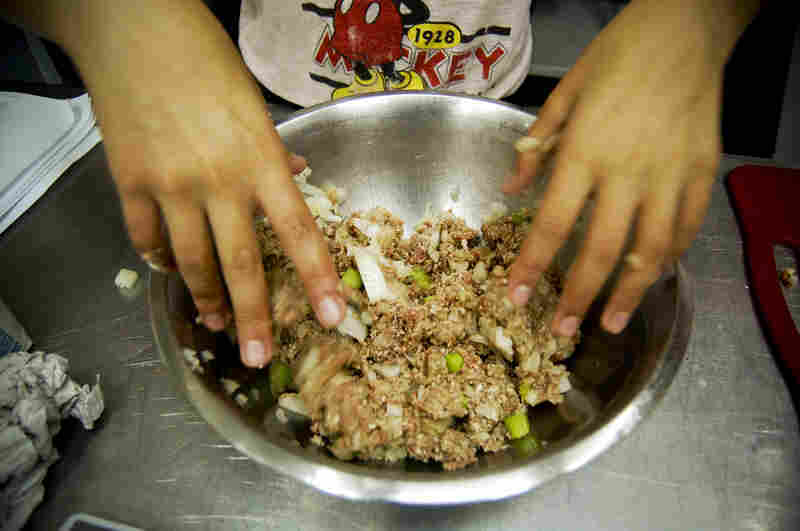 At cooking camp, Aviv Raz makes the filling for kubbeh hamusta, mixing onion into chopped beef. It's a beloved family dish her grandmother makes every Friday. In his recipe, the dumplings are made of semolina plus a little bulgur. The filling is seasoned ground beef. The kubbeh are cooked in a sour soup. 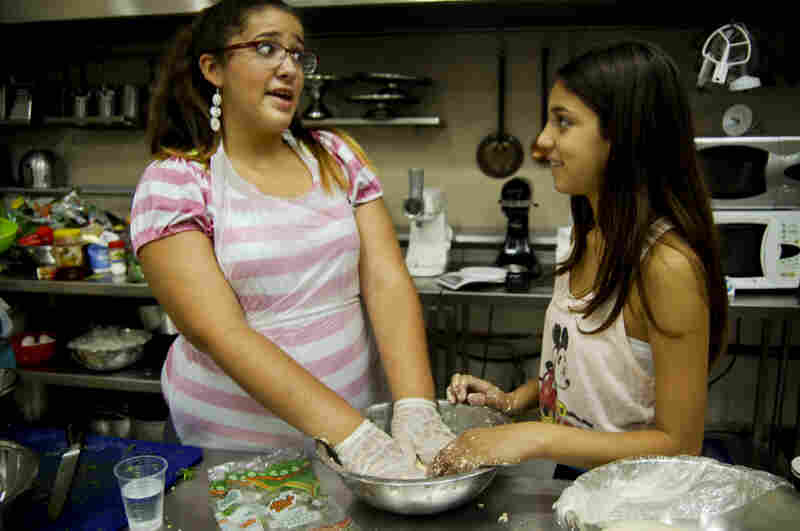 Camp participant Aviv Raz, 13, is thrilled to make kubbeh. "My grandma makes kubbeh every Friday," she says. "And all the family, they come, they eat kubbeh, all the cousins. It's great." Like hummus, kubbeh is one of those dishes that is well loved, with local varieties from Iraq to Egypt. The kids start by sharpening big knives. They chop onions, garlic and celery for the meat filling. Then they chop more celery, chard and zucchini for the soup. While the soup steams and the meat browns, they mix the dough for the dumplings. This is the hardest part to get right because of the semolina, a coarse flour ground from hard durum wheat. "The semolina ... reacts differently from wheat flour or from rice flour," Shlomi, the chef, explains. "That's why it's more thick than the Asian dumplings that we know. It's soft, but you want to feel it, you know, the texture in your mouth." He shows the kids how to first, grease their fingers, then roll a bit of dough into a ball, flatten it, put a little meat in the middle then pinch it shut. Raz pats away happily. Chef Shlomi tastes the broth and calls for more lemon. Raz and her friends gently slide the dumplings into the soup. Finally, the kubbeh and other comfort foods cooked at camp on this day are set out for lunch. Chef Shlomi tries a dumpling. "The texture of the dough [is] really, really good, soft, like it's supposed to be," he says. "Maybe a little salt in the filling, and a bit more vinegar, lemon." Raz rates her work tasty, but nothing compared to her grandma's kubbeh. 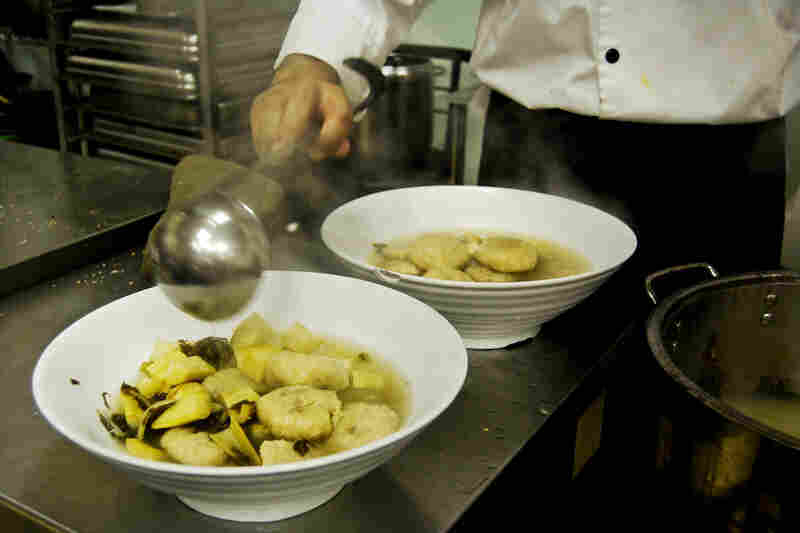 This recipe for the traditional Iraqi dumpling is from the Te'amim cooking camp at the Jerusalem Culinary Center. In a heavy skillet, lightly brown onions, celery and garlic in vegetable oil. Add meat. Cook on high for 10 minutes, stirring periodically. Add salt and pepper to taste. Lower heat. Cook until meat is browned. Remove from heat. Put semolina and bulgur in a bowl. Add water until soft and easy to work with (not sticky). Oil hands. Pinch off pieces of dough and roll by hand into medium sized balls. Use thumb to make a dent in the middle, then put a spoonful of meat filling. Close dough around the meat and flatten the kubbeh. Make all in advance, put on a platter. Place oil in soup pot. Heat, add all vegetables and lightly saute. Add stock, lemon, salt, pepper. Bring to boil, then turn heat to low and cook for about 40 minutes. Return to high heat, slide (don't drop) kubbeh into pot. Stir gently from time to time. Correct seasoning as needed. Cook on medium heat for 10 minutes, until kubbeh have firmed up. Serve as a soup with extra broth or remove vegetables and kubbeh from soup to serve.